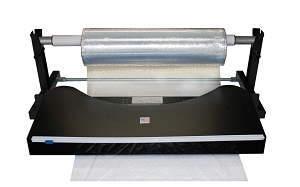 The stretch film applicator works with all types of stretch wrap film. The Film applicator will dispensers rolls up to 24" wide. Built-in safety slide cutter helps to complete your wrapping task quickly. The Patent Pending design allows you to wrap products quickly and easily. Film bundling system proudly made in USA. Use this dispenser to make sheets of Stretch film or Kraft paper. This sheeter is easier to use. TABLETOP STRETCH FILM APPLICATOR, stretch film applicator, film bundling system. Stretch wrap applicator , MESA STRETCH aplicador de película, tramo aplicador de película, sistema de empaquetado película. Estire aplicador envoltura.